They say ‘failing to prepare is preparing to fail’. Fortunately it doesn’t take much time at all to prepare your day. I’d say 10 minutes is more than enough, and if you have a decent time-management application, that can take even less. How we choose to use our technology in the morning can say a lot about how we’ll use it for the rest of the day. Do our devices exist just to entertain and communicate? Or do they have some greater purpose to enhance our daily lives? So we’ve listed 5 great pieces of software that allow you to plan your day in fun, exciting ways. They won’t all suit your working style, but that’s the point. We all have different productivity styles, but we’re certain at least one of them will be right for you. Try them all, one at a time, and see which one best helps you plan an amazing and productive day. If you’re a big Chrome user, you’ll know how Google’s browser has a myriad of awesome extensions and plug-ins that can superpower your internet experience. So what better place to start than your opening page’? Momentum turns your ‘New Tab’ page into a personal dashboard of to-do lists, inspirational quotes, weather and beautiful imagery. But my favourite is definitely the minimalist to-do list. It only asks you to do one thing, and then you have the option of ticking it off. It’s so simple that it seems silly not to use it. What is your main focus today? – That’s the question you’ll be asked every time you open your Chrome browser. Sometimes you’ll have to think about the question, which adds to the fun. Regardless of whether you actually answer it or not, simply thinking about it can be a very effective way to start the day. A lot of unproductive days emerge simply from lack of that sweet, sweet focus that can help bring context into a busy day. In the best-seller ‘Awaken the Giant Within’, author Tony Robbins describes controlled focus as ‘like a laser beam that can cut through anything’. A productive day starts with focus. With Momentum, you really have nothing to lose. Though by no means a conventional ‘day-planning’ software, it is nonetheless a powerful one. Mind42 might not suit everyone, but it’s an effective tool if you’re planning a busy day ahead and you really want to make the most efficient use of your time. It’s an option for people who are serious about planning. Mind42 has the advantage of visuals. No matter how good your to-do list is, nothing beats plain old images, complete in the form of diagrams that show you the interconnectedness of everything. You can see how the different aspects of your day will work with each other, the order in which your activities will take, and what subcategories each activity pertains to. In the style of most ‘mind-mapping’ softwares, Mind42 works in the form of a star-diagram. The central topic, can be, say ‘plan for my day tomorrow’. You then branch off into separate nodes. Each node can be a particular task you have to do on that day. Each node can then be attached with images, links, to-do’s and notes. The latter two being the most important with day-planning. The advantage of this over other time-planners is it’s essentially a to-do-list within a to-do list. This lets you prepare and plan with a higher level of detail. As you can see, mind42 is a software that can let you plan your day in great detail. But whether this is exactly what you’re looking for, or if it just seems too much for you, there’s no doubt: you get out of your plan what you put into it, and If you choose to go into this much detail about what-needs-to-be-done, then it’s hard not to have a productive day. MLO is a very popular smart planner, meaning it does part of the work for you. This is different to the other planners on this list, which require much more of your own personal input. It takes your information and generates a list based on what requires the most attention, based factors like context or location. There’s a reason people hire secretaries and assistants (that is, people who can afford to). It’s because, aside from obviously having someone to help organise your life, there is a powerful reinforcing factor that comes with somebody there to actively remind you, as well as easing the load on some of the mental energy that goes into performing tasks. With My Life Organized, you aren’t just planning tasks, you have an intelligent app helping you to organise them in a way that gets them done in no time at all. If you can’t wait around for A.I to get smart enough to help you with your busy life, then this app is a good place to start. A fun little surprise for iOS users, 30/30 is one of the App Store’s top rated apps, and number 1 favourite in the task and time management category. It’s no surprise that 30/30 is an iOS exclusive, because it’s the classic example of an imaginative product that the Apple community seems to attract. If you have an iOS device, check this baby out. The genius behind 30/30 is that it gets you excited about being as productive as possible. It does this not by punishing you for procrastinating, but by rewarding you for getting things done. For anyone who has studied personal development, they’ve heard the old theory that ‘the human mind doesn’t register negatives’. By creating a fun, playful and intuitive way of organising your tasks through prioritising, timing and strategic breaks, you feel rewarded for the time you spend. Its fleshy, organic interface doesn’t tell you arbitrarily ‘you must do this for 120 minutes today’, instead it asks you ‘would you like to do this today? If so, how long?’ The decision making is yours, and it lets you choose if you want to go through with it or not. It also tells you how much time your planned day will take up. So if you think to yourself ‘I couldn’t fit all of that into one day’, it’s often surprising to see how wrong you are. So far we’ve heard of apps that let you plan your day in all sorts of creative ways. But Plannerpro it takes us back to the good old fashioned calendar. It instantly syncs up with your other calendars, and gives you a view of your surrounding 40 days, give or take. The more bullet points on each day, the more tasks are scheduled. When you drill into the day, it gives you the view of a more standard day-planner. You can then add notes, tasks or events, and fill them out in a similar format to that of the iOS Calendar, Notes and Reminder built in apps. In fact, the app as a whole is reminiscent of those iOS apps, except Plannerpro simplifies this by bringing it all into one single app, so you aren’t having to fiddle around between different windows. Apple could take a leaf out of Plannerpro’s book and simplify things like Plannerpro does. The calendar is oldest time-management tool known to man, and its appeal remains to this day. Sometimes it’s just nice to look at your day from the perspective of your week (yes, there’s a cool little feature that lets you do this). And then there’s simplicity factor. Simplicity can be beneficial. While the other apps in this list may appeal to specific people, it can be nice to clear all the clutter and make things as simple as possible. While it’s an all-in-one app, it isn’t particularly brilliant at any of its features. 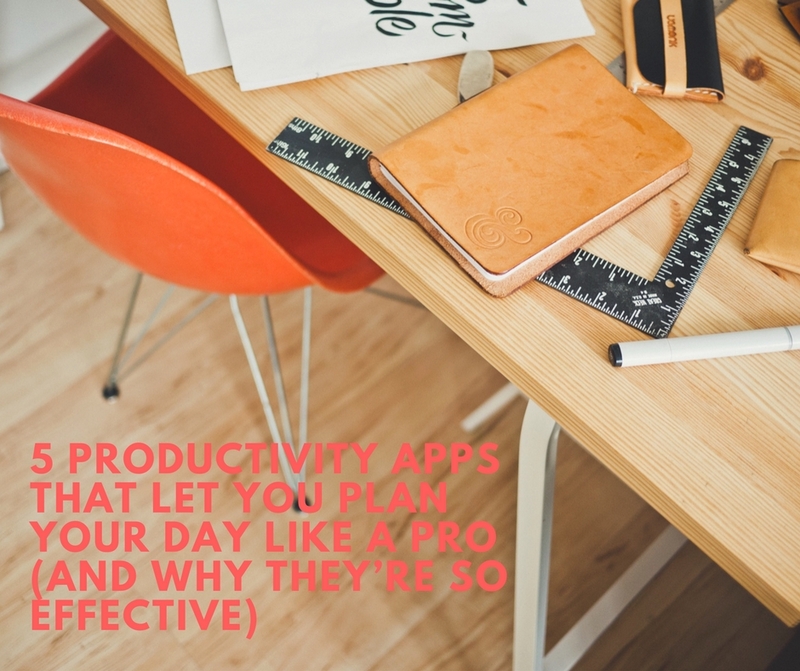 So there are our choices of productivity tools specifically for planning your day in effective ways. We encourage you to try them all, on separate occasions, and see which one works best for you. Do you think there is an app, site or software that should have been included in this list? If so, let us know about it, or share any of your time-management thoughts or experiences in the comment section. Thanks for reading!